Learn how quantitative intelligence can save you millions. Software project failure is a fact of life, right? It’s frightening how many organizations hold this belief—and yet it’s easy to understand why, when nearly 80% of all software development projects fail to meet their budget, schedule, or functionality requirements. But here the dirty little secret: it isn’t the really the projects that are failing; it's the failure to negotiate reasonable customer expectations. When organizations set arbitrary constraints based on wishful thinking or external pressures, those projects are doomed to failure before they even begin. So at QSM, we use data-driven estimation (based on 10,000 real-life software projects) to right this ridiculous wrong—saving billions of dollars, reclaiming millions of lost hours, and turning software project failure into a distant memory. 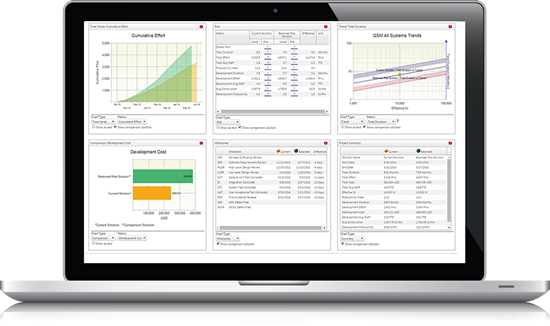 QSM helps you control schedule and cost while improving software quality. Avoid project disaster by calculating realistic cost and schedule and managing stakeholder expectations. QSM helps you produce smarter, more accurate estimates. QSM tools and services help you manage resource demand and plan for capacity. QSM tools and services help you find the true capabilities and limitations of your vendors. Our quantitative approach helps you prove what's reasonable—and what isn’t. Get impartial assessments of your projects, based on verifiable industry standards and benchmarks. Compare estimates to actuals in real time and forecast to complete. Estimation isn’t about seeing the future; it’s about using the past to make better decisions in the present. By looking at verified data from tens of thousands of past software projects, we can quickly and easily determine whether today’s projects are poised for success, or doomed to failure. Now that you know the truth about software project failure, we invite you to further explore the ways QSM tools and services can save your organization time and money.